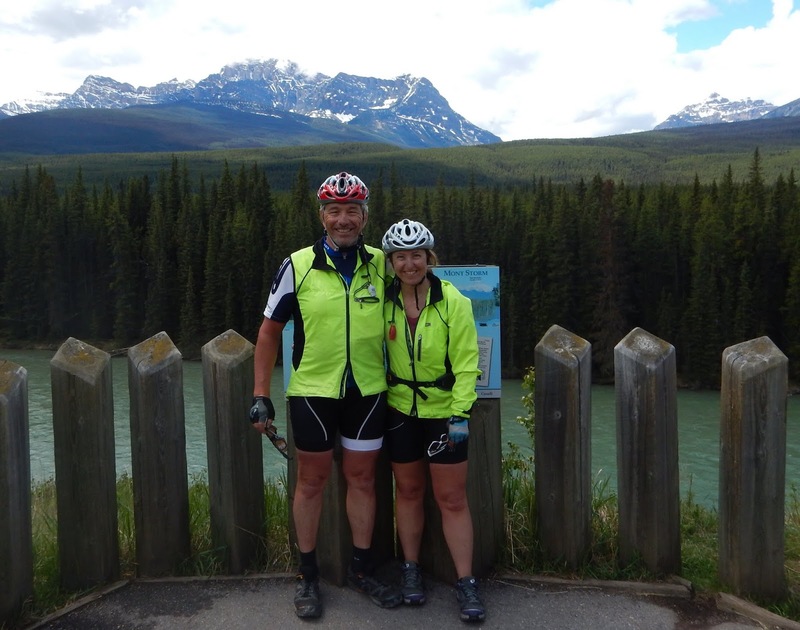 Today we rode from the Village of Lake Louise to Banff, a distance of about 60 km and mostly downhill. 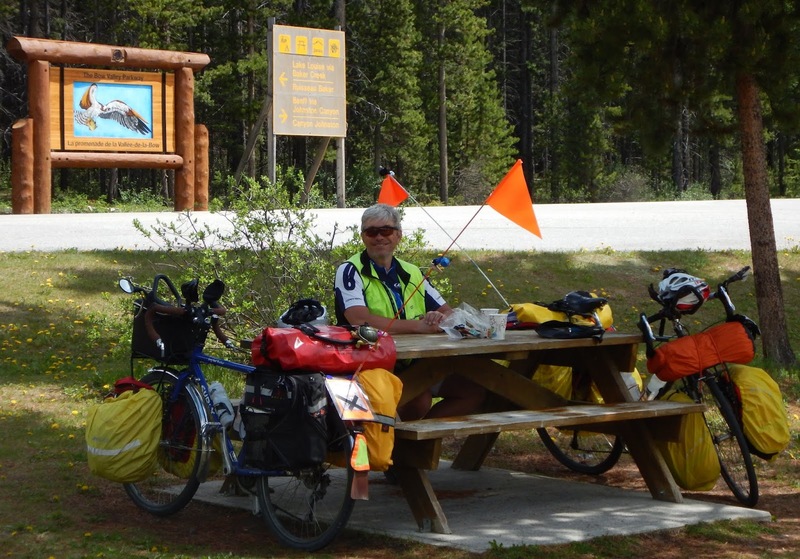 Before leaving the hostel, we exchanged pleasantries with two ladies who were cycling to Jasper and the Icefields Parkway. They were both Canadian Forces Health Care professionals from CFB Edmonton. Hélène fixed the front brake on their bicycle and I talked about our quilt and our insanely cute sewing machine. We wish them a safe journey and hope they will let us know about their ride. We did a bit of shopping at the sports store picking up new pedals for Hélène. All that climbing has given her a sore knee. With her current pedals she has to clip in all the time and cannot move her feet. These new pedals allow her not to be clipped in all the time and make moving her feet around possible. As we got ready to leave from the parking lot, we spotted Millon heading out of town. We had planned on taking the Bow River Valley Parkway to Banff, Hwy 1A. 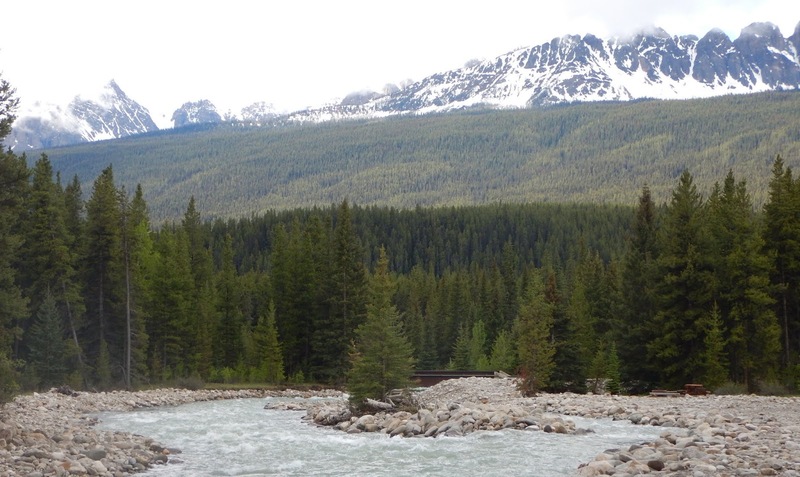 This is a quiet two lane road that goes through the Banff National Park. It is not well signed as you leave Lake Louise but we eventually found it. There is a big archway at the entrance and very informative signs on the large creatures one might encounter. We were particularly interested in what was said abput both the grizzly and black bears. The ride was like a Sunday morning ride in Gatineau Park less the grizzlies. The road was in excellent condition and with a posted 60 km speed limit. Very little traffic and everyone adhered to the speed limit. Did I tell you it was sunny and around 15 degrees...just perfect. We took our sweet time and treated this ride as a rest day. We did not see any bears but were aware of their presence as they use the sides of the road as their personal washroom. The only large animal we did see was an elk, who wandered across the road and decided to have lunch right there and then. Not having read up on elks, we were very cautious as we approached. By then a number of cars had stopped on either side of the road to take pictures and using the cars as protection we got by the big animal. As we went by him, we noticed two more elks in the woods near the road. After stopping many times along the route we finally made it to Banff. 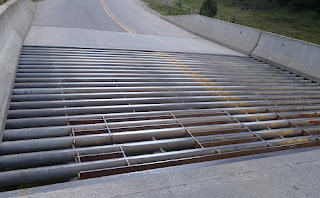 As we did many times in the last few days, we had to cross a number of Texas Gates along the route. 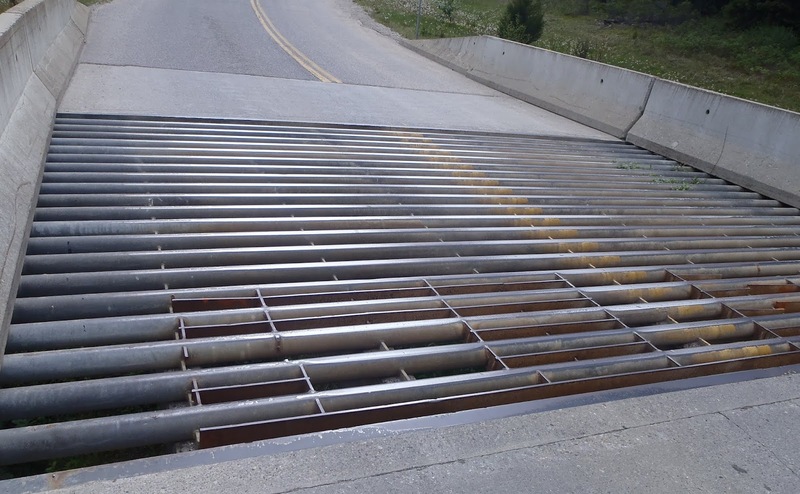 They are used to keep large animals off the highway or out of town. 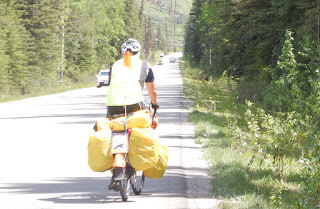 We found out from a gentleman in Banff that you can cross them at speed on your bike quite easily. We will wait for a demonstration before we try that trick on our own. Tomorrow we head out to Cochrane, that is just outside Calgary. 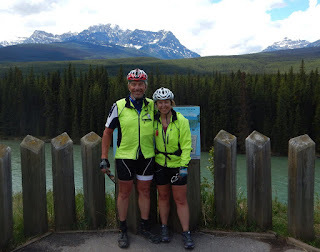 For the first half of the ride, we will follow a bike path to Canmore, and thus avoid Hwy 1. Although Hwy 1 has a wide shoulder, there is lots of traffic and not pleasant. We are spending the night in a Parks Canada campsite without access to Internet. We also have been warned of bear visiting the campsite and we have had to lock food and anything scented in a food locker. We will sleep with our bear spray cans at the ready. We leave you with some of the pictures we took. The still talking to each other couple! Many of our friends and acquaintances have gone to Europe on cycling holidays and reported on the incredible scenery they observed. After experiencing but a tiny bit of this great country, Hélène and I believe that we made a good choice by first discovering what Canada has to offer. The last few days have been quite the adventure. Keep it up! Ginette, the video is at the bottom of day 10. There is a video on Day 10 & 11 can you let us know if you are able to view them. We made the right decision with the hostel since it poured again last night with a temperature of 6 degrees. We had a lot of wet and damp stuff, our rain covers can only handle so much water. The ortlieb bags kept all the electronic dry however. Non je ne peux voir le vidéo et désolé que vous ayez perdu jour 11. Il se sera quand même toujours dans votre mémoire. You two are amazingly brave. I hope one of your rewards is to see Lake Louise sans rain. Fingers crossed for no more bears! Bill, we think you were brave to drive that road in the winter under such conditions. We will not visit the lake, we will do that on another trip in the region. Drumheller is the tourist thing we plan to do. We are off to Banff today and may stay 2 nights depending if we feel our bodies need a rest. Hope we can hook up as we near Calgary. Que de pluie....vous êtes malchanceux. Le coin est tellement beau au soleil pour l'avoir vu plusieurs fois. En sept. 99, nous était un petit groupe de "jeunes retraités" qui sommes allés faire une semaine de marche dans les Rocheuses. On séjournait au Lake Louise Hostel. J'espère que c'est aussi bien que dans le temps. Dan and Helene, your blog is addictive, just like Hawkins Cheezies. I hope you enjoy your visit in Banff. Helene, keep your bear repellant handy, the bears like Banff too. Dan, stay close to Helene. Will you be able to fit in a trip to the Banff hot springs to soothe your achy muscles? You guys stayed in Banff with the sun. I decided not to do the icefields parkway due to the weather, you know what I'm talking about... I'm already in Calgary right now. Its been sunny all day I'm actually sunburned. If you aren't past Canmore yet have fun on the 1A to Calgary, the first 25km is gravel trucks flying by creating dust clouds in your face, gravel all over the shoulder then the next 35km is winding road with no shoulder at all. 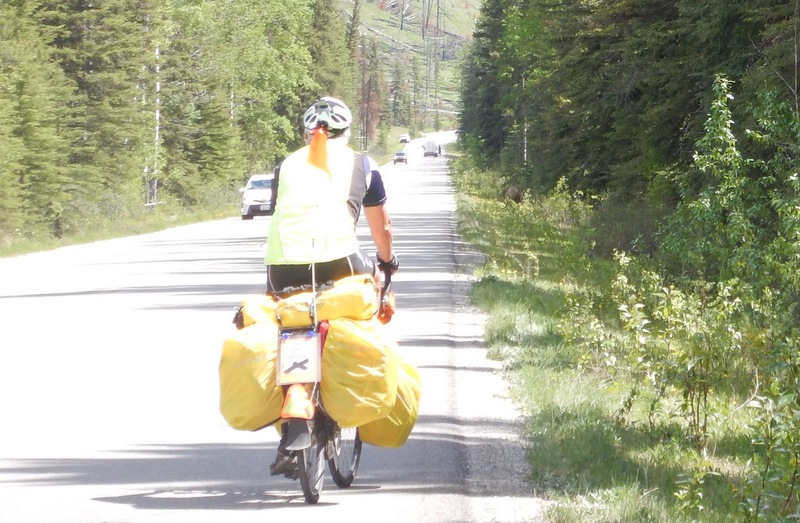 Then you get about 2-3 feet of shoulder and a nice long climb leaving Cochrane then a bit after the top like 10 feet of shoulder! But once you get near Calgary it gets so hectic 4 lanes on each side divided highway on the 1A. I don't know how I'm going to get out of Calgary, not going back on that. Enjoy Banff the mountains there are amazing and everywhere. I made it out of Calgary alive, biked 160km yesterday and 100km today. I hate Calgary and I love Highway 9. That must have been some day 160 km. Looks like a little frustration about Calgary really motivated you. We plan on avoiding any and all major cities for that very same reason. Be safe and keep us posted on your progress.